In this latest episode of Cawfee Tawk we don't drink coffee, we don't embed coffee in fried dough, we use coffee as an art medium. 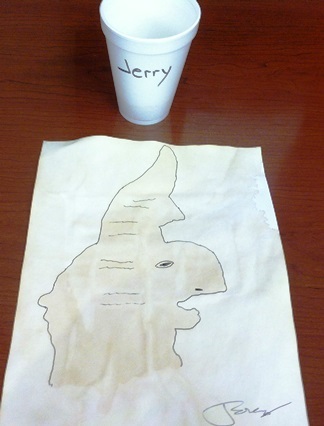 We spill a little coffee (yes, on purpose) on an empty sheet of paper and allow it to dry over night, Then we allow the coffee stain to inspire the artist inside of each of us. 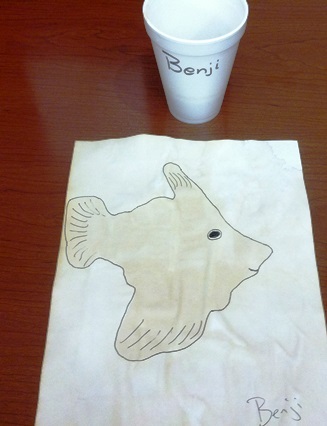 Benji appears to have been inspired by a recent trip to the Georgia Aquarium. 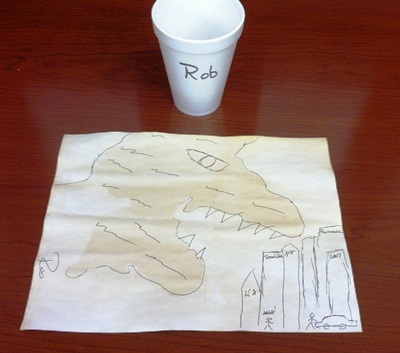 Rob tapped into a scene from one of his favorite movies, and I went back to the Jurassic era for my masterpiece! We're already working on the next episode of Cawfee Tawk, you can catch all of the previous episodes here. And be looking for your opportunity to pick up some authentic, official Cawfee Art in the near future. They're limited edition, collectible, suitable for framing and make great gifts too!